Driving down lead cost is foolish. We optimize on your net profit. Call me to discuss my marketing. We won’t call you (unless you want us to) and we NEVER spam. Striving for low cost per lead is foolish. Most PPC managers have one thing in common: They are just employees. Over the years customers have instructed PPC managers that a low cost per lead is the goal. Lacking any business acumen the PPC managers foolishly complied. We are the only PPC management company that reports the profit made (ROI) of each closed lead back to AdWords down to the keyword level using reliable software that we created. What we find by doing this is AMAZING. Generally, less expensive conversions produce a lower ROI and expensive ones produce more. How many profitable dollars have you left on the table by driving down your cost per lead? We provide an AdWords Lead Manager™ for every customer. It’s like a screening CRM.When your salespeople close a deal (or qualify the lead as having potential value) this data gets sent to AdWords (and other platforms) on the fly. The picture it paints is beautiful. We know what days, cities, zip codes, devices, ads, and keywords are bringing you in the best ROI and where you’re losing money. There are a few PPC companies that claim to do this but it’s done by humans and subject to errors. We track profit on everything including phone calls and location visits. We do this with software which is not subject to human interpretation. We are relentless profit seekers. We want to see your books. When was the last time a PPC company asked you for a P and L? We do. We insist on knowing how money flows through your organization, your COGS, your EBTIDA, and other metrics. This helps us to advise you on maximum acquisition cost per unit sold and several other goals to which we must adhere. We are the masters of reducing expense and increasing profit, both by margin and by volume. The PPC Lead Manager™ is included with every account and integrates with your existing CRM. It’s so easy to use that no training is required. The PPC Lead Manager™ is perfectly customized to your sales process and existing infrastructure and causes no staff discomfort. No learning curve, no sales process adjustment. Track phone call and offline leads. Included With Every Account, Even eCommerce. We don’t hire PPC Managers. We train new ones. Our staff is required to have a financial or business background. Becoming a good PPC manager isn’t easy, but training someone how to run a business is impossible. We look for potential employees that have managed or owned a business and understand financial principles. Every applicant must be able to look at sample P and L’s and determine things like gross margin, net profit, EBTIDA, and so on. Accounting concepts are critical to optimize PPC based on profit and we’ll only hire managers with the ability to understand financial metrics. 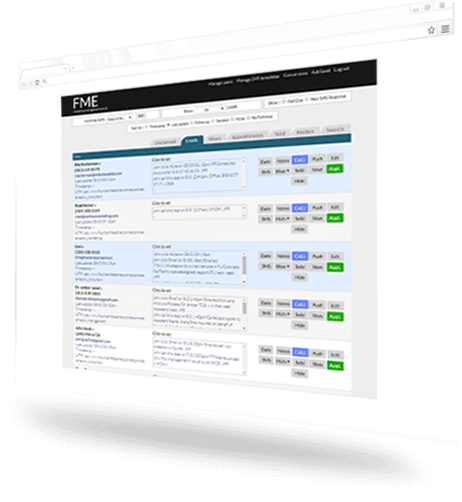 The PPC Lead Manager™ is included with every account and integrates with your existing CRM. It’s so easy to use no training is required. We offer a written performance guarantee on every account. That’s Right. And we’re the only PPC company that does it. Before a client enganges with BlueOceanPPC, we perform an in-depth analysis of the account at no charge. We then outline a set of performance goals that we are to meet at specific times during the relationship. If those goals aren’t met, we return our management fees to you for those periods. New to PPC or have no historical performance data? No problem. If your account doesn’t have enough historical data for us to identify performance goals, we’ll write a set of best practices to adhere to. These will include the best practices from the platform (ie. Google AdWords Best Practices) in addition to our own. If any of the best practices aren’t followed, we’ll return our management fees. When you bring us a written offer we will offer the same services for 10% or politely decline the offer. We will customize a proposal to include the same services as the company making the offer and exclude any standard features not listed on their proposal. 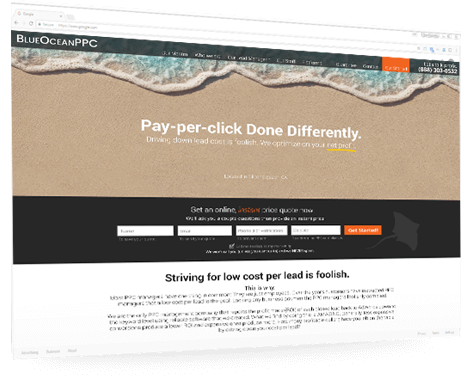 We want you to feel you’re getting the best value and the best quality of service from BlueOceanPPC and we’ll stop at nothing to make sure this is the case. Simply contact us and we’ll have you email us our competitors pricing and we’ll beat it. Everyone charges a percentage of budget. We don’t. If you spend less than $20,000 a month on PPC we’ll only charge you one flat-rate fee for management. This fee includes everything. We have no upsells or add-ons. The PPC Lead Manager™ , Full Profit Reporting, PPC Management, Landing Pages, and Acounting/Profitability review are ALWAYS included in every account we have at no additional charge. We include a custom, hand-coded landing page for every client (except eCommerce) which is continually optimized based on your PPC trend data. We include a custom, hand coded landing page for every client (except eCommerce) which is continually optimized based your PPC trend data. We include a custom, hand coded intermediate CRM for prequalifying leads and reporting profit back to AdWords, etc. Integrates with your existing CRM. We report every dollar of every sale from every lead we generate back to AdWords, etc to paint a picture of where the most profit dollars originate. This is used to optimize your accounts on profit. Rock out with your profit out.